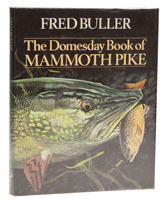 If I have to name a book about fishing that is the one I would take to the mythical desert island, then without any question whatsoever, this is it, Fred Buller's absolutely classic, utterly enthralling, never to be repeated Domesday Book of Mammoth Pike. Even the title is perfect. Have you never read this? Shame on you. Just about the only reason why might not have done is the ticklish problem of the cost of laying hands on the book these days - first editions have climbed to dizzying prices and if you pay anything under £400 for a copy with a dust jacket and in good nick, then you can give yourself a pat on the back. Just to rub in the tremendous demand there is for this book, look at the price it sold for, back in 1979. Yep, under a tenner. Okay, so here we have a scandalously expensive classic that has appreciated faster than gold, so what is the magic formula? A lot of back-breaking research, is the answer. Fred spent many years patiently writing letters, visiting libraries, talking to officials from angling societies and pouring through the Fishing Gazette and numerous other sources, until he had cross-checked everything and was happy that he had his facts straight. His research was so good that the book has never been seriously questioned and the only update worth a damn is Fred's own More Mammoth Pike. Part of the footwork was taking photographs and Fred - who was trained as a naval air photographer - somehow managed to translate his training into taking static ground targets and made a reasonable fist of it, which is just as well, because taking pictures of stuffed fish in cases isn't the easiest occupation in the world. He wasn't finished though, not by a long way. Then Fred had to order the pike in descending weight from a 92 pounder lifted out of the Shannon down to a tiddler of a mere 35, and then he wrote stories about the most of them. It is the stories that make the book, because some of them are completely off the wall, my favourites including the tale of an Irish ghillie's wife who lifted a cracking specimen out of the water by its eye sockets (I can't imagine it paid to cross her) and, of course, the Endrick pike, which, for all that it probably only weighed 70 pounds, has the meanest expression of any fish I have ever laid eyes upon. The best book Fred has written, no contest.